The newest WWE historical DVD release, ?The Rise and Fall of WCW,? leaves you wondering if you just watched a preview or the actual feature presentation. After WWE did such a brilliant job on ?The Rise and Fall of ECW? a few years back, wrestling fans were eagerly anticipating this project. Unfortunately, it only scratches the surface on what could have been a fascinating look at the biggest collapse in modern day wrestling history. The DVD starts out covering around 40 years of history in less than ten minutes. They talk a bit about how Jim Crockett Sr. got started promoting wrestling, his company being a part of the NWA, and how his company would one day become WCW. Some time is then devoted to Jim Crockett Jr. taking over and the early days of his Mid Atlantic promotion. They then talk about the early days of wrestling on Ted Turner’s TBS Superstation. This wasn?t Crockett’s promotion, but rather Jim Barnett’s. However, since both promoters operated under the NWA banner, Crockett’s wrestlers were often featured on the Barnett run TBS show. Honestly, if one doesn?t already know some of this history, you?re probably going to be left confused. It’s a bit hard to follow at times and a very quick run thru history. The focus shifts to ?Black Saturday,? which is when Vince McMahon bought out Jim Barnett’s wildly popular Georgia Championship Wrestling promotion. The DVD covers this rather briskly and it’s hard to follow, so I will do my best here over the next couple paragraphs to explain the true story on what happened. ?Georgia Championship Wrestling,? a show produced by Barnett’s promotion of the same name, had been the first nationally syndicated pro wrestling show. It began airing on Ted Turner’s TBS Superstation in the mid 70s during Prime Time on Saturday nights. The television show’s name was changed to ?World Championship Wrestling? in 1981, but Georgia Championship Wrestling remained the organization behind the shows. GCW was the highest rated show on cable television in the early 80s. However, behind the scenes money wasn?t being managed well nor was the rest of the company. Head booker and part owner Ole Anderson was booking his top stars in other NWA territories across the country (due to their high national visibility on the Superstation) more than in the company’s own Georgia territory. GCW began to suffer financially, and in mid 1984 Vince McMahon bought the organization. Vince closed up shop on GCW and used its ?World Championship Wrestling? timeslot on TBS to air WWF programming. Fans of the GCW promotion tuned in on July 14, 1984 for their weekly episode of ?World Championship Wrestling? 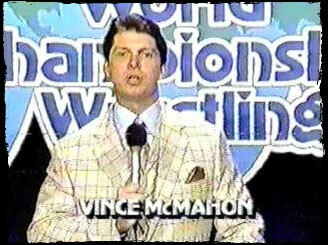 to find young Vince McMahon welcoming viewers to a new era for the ?World Championship Wrestling? show, now featuring WWF performers. Fans were not happy, as they were used to the more athletic GCW matches, not the squash matches the WWF show would feature. This day would forever be known as ?Black Saturday.? After fielding complaints from viewers for weeks that they wanted their Georgia Championship Wrestling back, Turner granted Ole Anderson a time slot on Saturday mornings for his new promotion, Championship Wrestling From Georgia. Soon after this, Turner gave another company a timeslot on Sunday nights, Bill Watts? Mid South Wrestling. Of course on the DVD they fail to mention that both of these shows destroyed Vince’s WWF TBS show in the ratings. Vince McMahon was pissed, as he thought his buying GCW guaranteed him exclusive rights to wrestling on TBS Superstation. These moves forever severed any friendship that Ted Turner and Vince McMahon might have had, and it essentially was the first shots in what would become the bitter Turner/McMahon wrestling war. Crockett wanted to get his promotion on TBS, and Turner was not happy with McMahon. McMahon’s original agreement with TBS had called for WWF to film first run programming in Atlanta to air in the Saturday night timeslot. Vince was airing pre-taped stuff with Turner all the while pressuring him to film in Atlanta and make good on their contract. With Turner almost ready to kick WWF off TBS, McMahon sold his timeslot to Crockett for $1 million. This was actually more than he had paid for GCW. Vince says on the DVD that he ?actually made a few bucks? off the deal, and Crockett proclaims that in buying the timeslot from Vince he essentially financed the first WrestleMania. This is an interesting statement, considering WrestleMania occurred before McMahon sold his TBS timeslot to Crockett. McMahon points out that Crockett wanted the time slot because it was a stepping stone to taking his company national, the same thing he (Vince) was doing at the time. As far as the other two wrestling shows that were on the Superstation, Bill Watts eventually agreed to step aside and ended his show on TBS, putting over the new Crockett run TBS show in the process. Crockett bought out the new Saturday morning Ole Anderson project. The end of these two companies is not covered on the DVD. The rest of the 80s are covered rather briefly, talking about the success of the Crockett promotion. This includes an unintentionally hilarious quote by Magnum TA comparing the popularity of Crockett’s wrestlers during the company’s heyday with Elvis and the Beatles. There are no mentions on the DVD of the PPV wars that McMahon and Crockett had in late 1987 and early 1988. It would have been interesting to hear Crockett and Vince talk about the famous incident where Vince booked the first Survivor Series on the same day as Starrcade and told cable operators if they carried Starrcade he wouldn?t allow them access to WrestleMania IV. Likewise, Vince airing the first Royal Rumble for free on USA Network head to head with Crockett’s Bunkhouse Stampede PPV and Crockett airing the first Clash of the Championships free up against Vince’s WrestleMania IV PPV. That period in late 1987 to early 1988 was one of the most interesting times in wrestling history, as it relates to the early days of pay per view and setting the tone for the ruthless war waged between the companies in the 1990s. Yet there is no mention on the DVD. A missed opportunity for sure. Instead, the documentary skips ahead to Turner buying out Jim Crockett Promotions and renaming the company WCW. There are some brief highlights shown of the stars of the 80s (Horsemen, Flair, Magnum, Sting, Koloffs, Luger, etc.) There is then a feature on the revolving door of Presidents the company had over the late 80s and early 90s. Curiously, they also talk about the days of Dusty Rhodes being head booker and glorify it. When in reality, as is commonly known, the famous ?Dusty Finishes? he booked over and over nearly nearly killed the company in some markets. Eventually, we are brought to the days of Eric Bischoff taking over, Hulk Hogan coming in, and the creation of Nitro. That’s right, the early 90s for the most part are skipped over. Nothing on Sting except a few brief clips. Nothing about Flair leaving for WWF and then coming back. Nothing about Vader. Nada. Bischoff does get credit for having a lot of good ideas, although they do point out that the idea for the nWo came from Japan. They talk about the beginning of the nWo Hall and Nash’s ridiculous contracts, and Vince’s lawsuit against WCW over them portraying Hall and Nash as being WWF wrestlers invading the company. That part was interesting, as they show a few brief stills of the actual lawsuit papers. But like everything else in the DVD, this is very briefly covered. The nWo storyline is given a good amount of time. They talk about how Bischoff had originally wanted to in effect split the company into two and have a nWo show and a WCW shot. Curiously there is absolutely no discussion of Sting’s year long silent “crow” warrior storyline with Hogan and the nWo. The primary angle that got the nWo hot in the first place. Not to mention what was probably the best built storyline in company history. As you probably would have guessed before reading this, the cruiserweight division is sadly given only a very brief segment. It’s mostly just Jericho giving his thoughts. Goldberg says those were the matches he would always watch. And yep, that’s about all they have to say. Moving on? The rise of Goldberg is covered somewhat in depth, and they point out the idiocy of giving away his match with Hogan on free TV as well as the criminal act of Nash defeating Goldberg at Starrcade ?98. They really kind of rail Nash on this, and point him out to be someone clinging to his spot and holding others down. Same goes for Hogan and Hall. There is no mention of Bret Hart’s arrival in WCW or the Flair/Bischoff lawsuit. Instead we get chapters on Karl Malone, Dennis Rodman, and Jay Leno. There’s also a segment on David Arquette becoming world champion. Don?t get me wrong. These celebrity occurrences definitely deserved chapters. Especially the Arquette bit, for the sheer stupidity of it (for those wondering, they don?t mention Judy Bagwell’s run as tag team champion). But it’s questionable to include that, and nothing on Hart or the Flair/Bischoff lawsuit. The later years of WCW are made to look like a joke, because quite frankly it was a joke. They talk about Vince Russo, all the gimmicks the company tried to get viewers (mentioned is the “live” Kiss concert), the Hogan/Jeff Jarrett incident at Bash at the Beach (they portray this as a shoot, by the way), and Jarrett’s run as Champion at the very end of the company. The documentary buries Jarrett in particular. Eventually we get to the sale of WCW to McMahon. The process of selling the company isn?t really covered in depth. There is no mention of Bischoff fronting a group to buy the company, and then backing out once they found out they wouldn?t have TV. Instead, they basically say the AOL/Time Warner forced the closing of WCW (true) and Vince immediately bought it (false, after Bischoff backed out). There’s a funny moment where Jericho says after he found out how little McMahon bought the company for, he had wished he bought it at that price. Overall, the documentary clocks in at around 1 hour and 45 minutes. It’s not bad, it’s just not great. And after the stellar job the company did on the ECW disc, I was expecting great. It just comes across as rushed and very brief. I feel like I just read a sparknotes version of the company’s story when I wanted to actually read the entire book. That being said, the package is worth picking up for the fantastic matches included on discs two and three of the set, many of which have never seen an official release on DVD. As for the true story of WCW, I?ll eagerly be awaiting an official DVD release on that, as I still haven?t seen it.